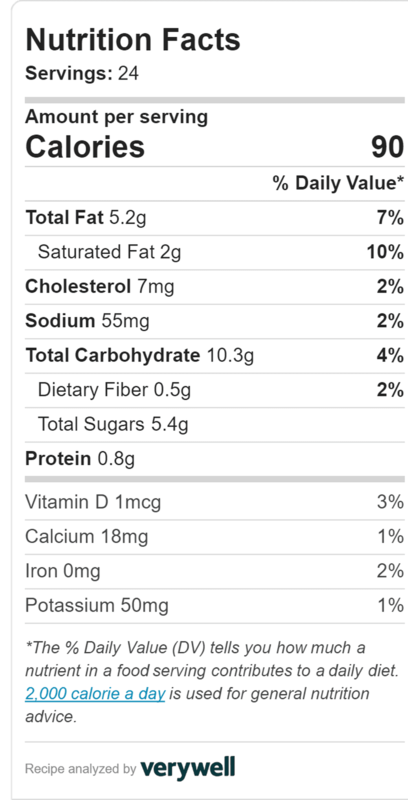 Are chocolate chip muffins healthy? They can be! 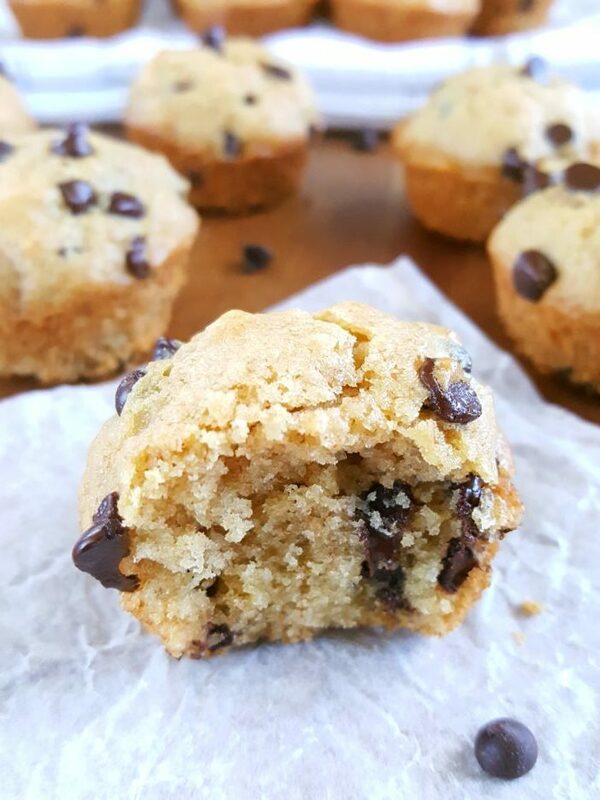 These healthy mini chocolate chip muffins are soft, moist, and delicious. They’re quick and easy to make and ready in 20 minutes. Perfect for a fun breakfast or snack that kids and toddlers will love! 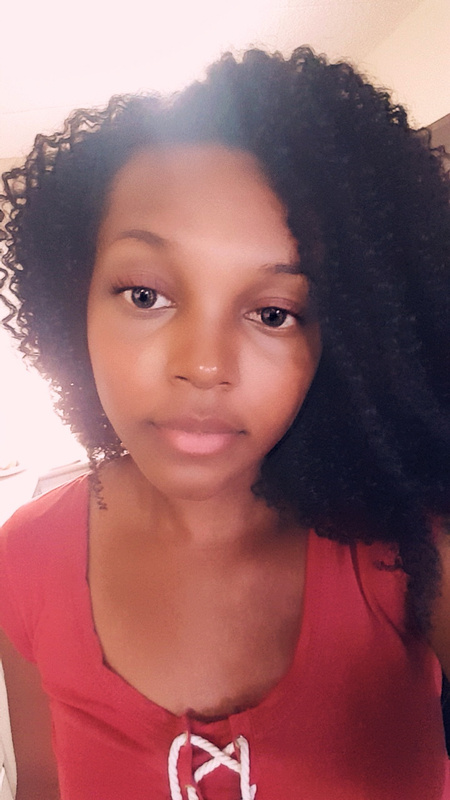 I’ve been baking a ton since the month started and so we’ve been consuming a lot of sugar because everything needs to be taste tasted and I hate wasting food so I try my best to incorporate healthy recipes as much as I can. Also, we’ve also been having way too many junk food breakfasts. You know exactly what I’m talking about. Sometimes you have breakfast foods that aren’t really breakfast food because it’s easier to just throw some high corn syrup O’s cereal in a bowl with some milk and eat it. We all do this. I’m guilty of it too. It’s quick and definitely convenient but it’s not healthy. After being overloaded with unhealthy calories, I think that these little whole wheat chocolate chip muffins are just what we needed. Super cute, fun to make, and fun to eat! No complaints from the kids whatsoever. And not only do these muffins make for a kid-friendly breakfast, they’re great for the lunchbox too. 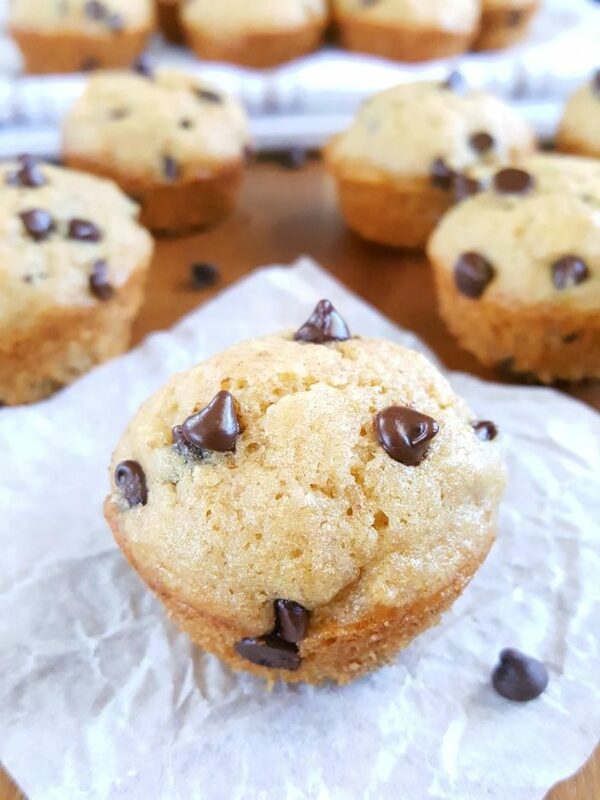 So if you’re looking for a delicious and easy recipe for mini chocolate chip muffins for toddlers and kids, look no further! I honestly don’t know one child that doesn’t love having chocolate chip muffins for breakfast. I love making them for my family but they can be overly sweet and very high in saturated fat and calories. 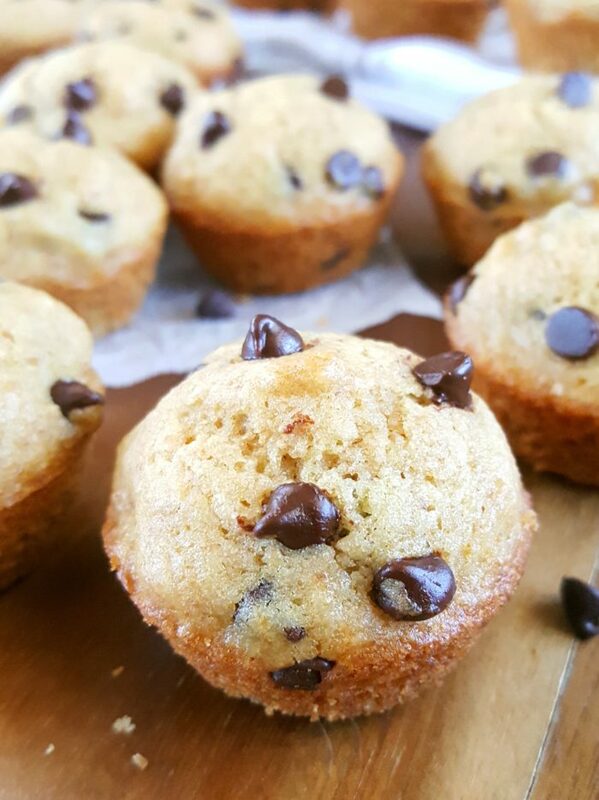 That’s why I created this recipe for healthy whole wheat chocolate chip muffins with oil instead of butter, less sugar per muffin, and the perfect size for toddlers and kids! Another plus is that these whole wheat muffins don’t even taste like whole wheat muffins. You get what I’m saying? Sometimes they can have this harsh texture or be extremely dry. These two reasons alone made me avoid whole wheat baked goods for years. Fortunately, that’s not the case with these muffins! Even the pickiest of eaters will approve. This is one of the best mini muffin recipes you’ll ever try that also happens to be healthy. In fact, this recipe is so good that it inspired me to make more healthy mini muffin recipes. I have a couple that are already in the works. Yes, you read that right! These muffins are only 90 calories per serving! No butter (dairy-free), whole wheat, less sugar per serving compared to other muffins and less saturated fat too, but still just as delicious. And because they’re whole wheat they’re much more filling than white-flour muffins and will keep the little buggers fuller, longer! Feeding your kids healthy low calorie mini muffins means that you don’t have to feel guilty if they have two or three or even four! They’re a lot better and healthier than the snacks and muffins you’ll find at the grocery store, believe me. I’m telling you these muffins are good all around. They taste good and they’re really good for you too. In other words, they’re delicious and nutritious! Kids and adults alike love these mini choc chip muffins. These miniature muffins are sweetened with brown sugar. It’s not much though; only ½ a cup, loosely packed. A scant half cup if you will. I tried using an all-natural sweetener (honey), but it didn’t work out too well. The flavor was just off and the consistency of the batter wasn’t right either so I had to stick with solid sugar. This is a one-bowl recipe with simple ingredients and quite literally only takes about 8 minutes to come together. Yes, seriously. It’s that easy. You’ll see for yourself. Preheat oven to 350°F and prepare the mini muffin pan. In a large bowl combine oil, sugar, and salt. Beat in the egg and vanilla extract then stir in the milk. Add flour and baking powder and stir until fully incorporated then fold in the chocolate chips. Scoop the batter into the mini muffin pan. Bake for 10 – 11 minutes until a toothpick inserted comes out clean. Cool in pan 10 minutes. Enjoy warm or fully cooled! They taste so good warm, straight from the oven. I find that it’s best to use mini chocolate chips for this recipe, not only to keep up with the “theme” but also because you get more chocolate in every bite and they’re more evenly dispersed. I really do love healthy muffins; especially healthy chocolate chip muffins. 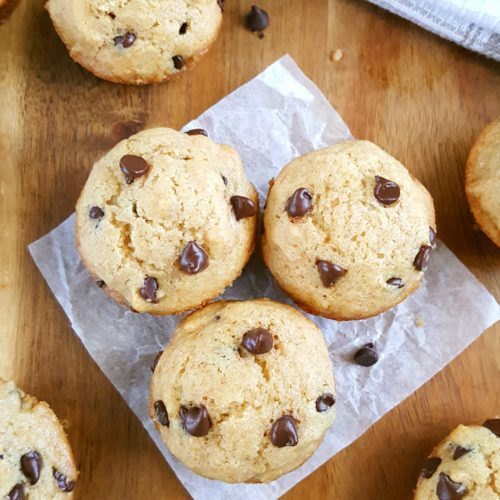 These healthy chocolate chip muffins for toddlers will not disappoint! 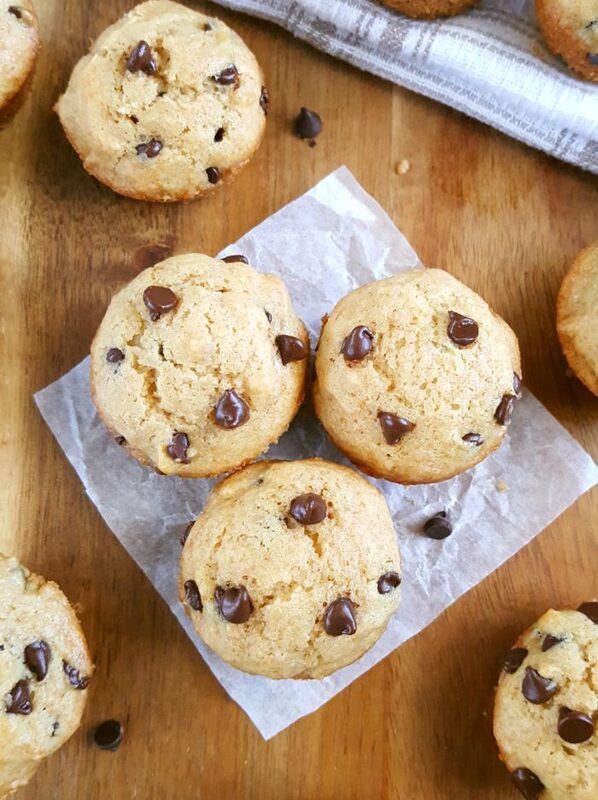 These healthy mini chocolate chip muffins are soft, moist, and delicious. They’re quick and easy to make and ready in 20 minutes. Perfect for a fun breakfast or snack that kids and toddlers will love! Preheat oven to 350°F. Spray mini muffin pan with nonstick cooking spray, grease with oil or line with mini muffin liners and set aside. Add flour and baking powder and stir until fully incorporated. Do not over mix. Fold in the chocolate chips. Scoop the batter into the mini muffin pan filling the cups about two-thirds of the way full. Bake for 10 - 11 minutes until a toothpick inserted comes out clean.